We invite you to become a male ally by joining the gender conversation—on campus, at work, and in life. One of the first steps to being part of the discussion is knowing what's happening. In this section, we share the news and noteworthy pieces that highlight what Forté, and our sponsors, are doing in this space. We hope to see this space grow more and more going forward. Check back often and please share with us any Male Ally news pieces that got your attention. The "MeToo" movement has given a platform and powerful voice to women speaking out about both sexual misconduct and everyday gender inequities. 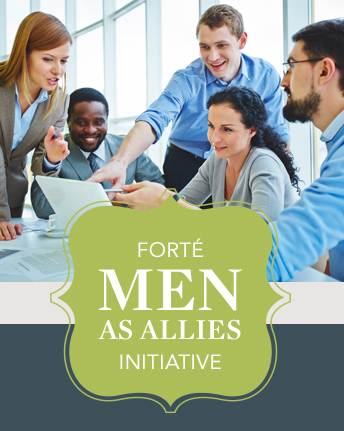 How 'Men as Allies' Can Aid Women in Business Education"
On this edition of "Walk the Talk," Elissa Sangster, Forté Foundation executive director, discusses efforts to increase women's access to business schools. She speaks with Bloomberg's Scarlet Fu on "Bloomberg Markets." Men can—and must—do more to support gender equality at work. Here's where to start. Top MBA programs around the country are working to promote gender equity by developing initiatives that turn to men as allies.